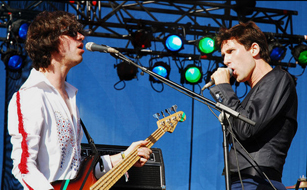 When Jamie Lidell sent members of his backing band into the crowd during his Saturday evening Lollapalooza set, he couldn’t have known that it would serve as a metaphor for his 55 minutes on stage. If he did, and he still allowed his mates to leave him solo on the MySpace stage for almost half an hour, the 34-year-old soul singer is more self-destructive than even his scatterbrained interviews and occasionally absurd concert getups let on. But by the time that Lidell’s smooth vocals belted out the tune’s repetitive chorus, “Gotta get this outta my system,” the thousands who skipped Okkervil River’s set at the festival’s opposite end were left wondering whether he was singing about his recent R&B material. And it wasn’t until after that fourth song did the irony of its opening lyric, “My doctor told me that I was not a machine,” take shape. After pitch-perfect renditions from his recent 1970s soul revival, the quirky performer reached in to his experimental roots’ bag of tricks and pulled out a half-hour beat box solo. Sending his costume-wearing ensemble to join the gyrating masses, Lidell assumed a familiar position alone between a pair of laptop computers and a massive mixing board. By cupping the microphone in one hand and twisting knobs at a mad scientist’s rate with the other, his Stevie Wonder-like voice was manipulated into a fuzzy mess of special effects. Yet, the actions of his now ground-level band mates mirrored Lidell’s gig. Although they were literally kicking up dust from the softball diamonds in Chicago’s Grant Park during their in-crowd dance routines, the band’s antics lost momentum quickly. After almost 10 minutes of wiggling their hips and shimmying through the crowd, they stopped and made a beeline for the backstage gate to resume their positions alongside Lidell. However, security was tight at Lollapalooza, and the staff member hadn’t noticed the musicians on stage and mistook them for just a couple of extravagant concertgoers. The two weren’t allowed to re-enter through the VIP gate and were forced to take the long route by way of another guard who had watched the events transpire. The now off-track set seemed almost certain to stay derailed, especially since the crowd who had lost interest in Lidell’s vocal alterations was left with only his on-stage entertainment. By the time the full band returned to again riffle through songs, more than 30 minutes had passed. With just enough time for a few more Jim cuts – “Where’d You Go?” and the coincidentally titled “Wait For Me” – Lidell and his exhausted supporting cast convened for a half-a cappella version of the title track to 2005’s Multiply. The ode to the good ol’ days took on a slightly different twist for those who remained around long enough to see Lidell get back to doing what he does best ¬¬– singing. As the group moved from sharing a mic and standing arm-in-arm near the front of the stage, and went back to their regular positions at their instruments, the crowd’s cheers were at the loudest of the performance. Unfortunately, the cheers might have been out of relief that Lidell wasn’t going to encore alone.